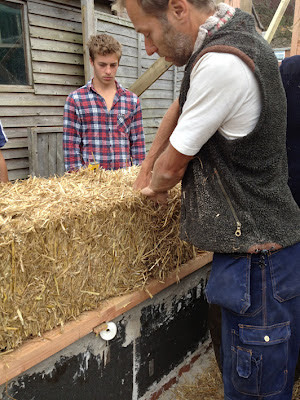 More on those once I've got this blog up-to-date - for now here's Bales part1. 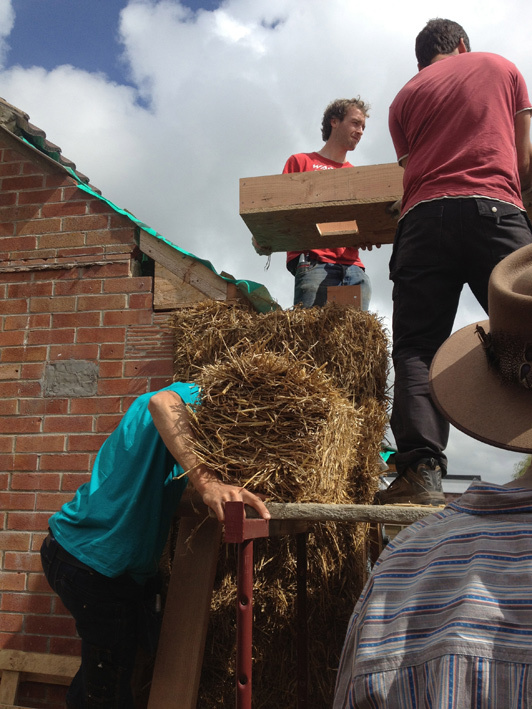 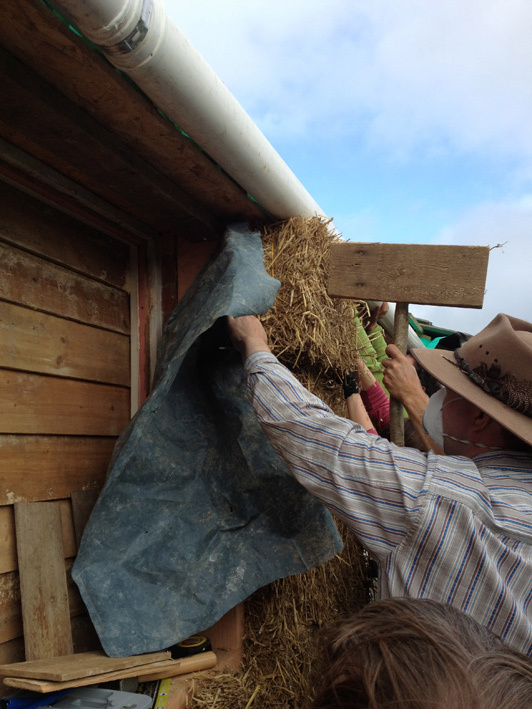 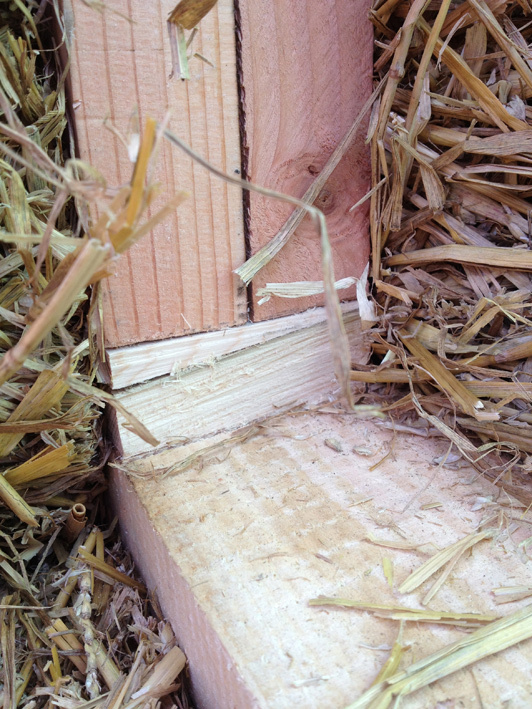 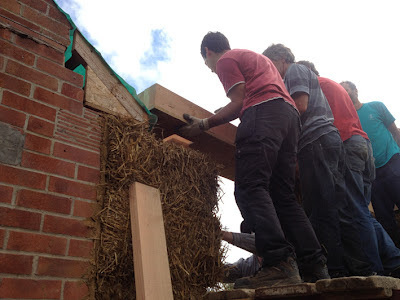 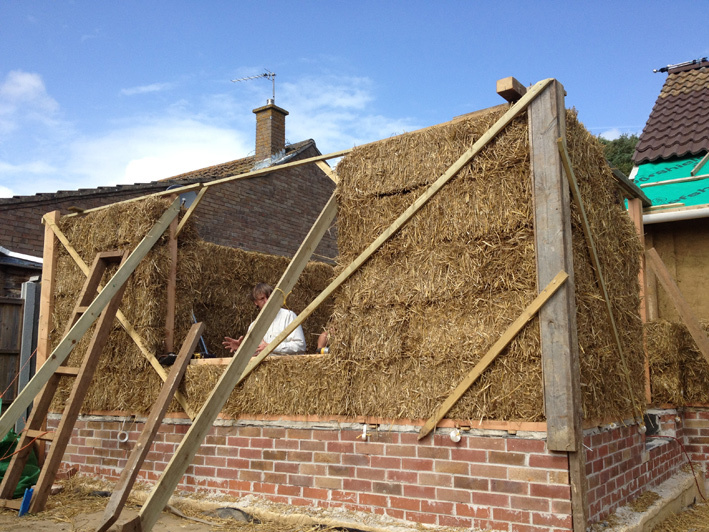 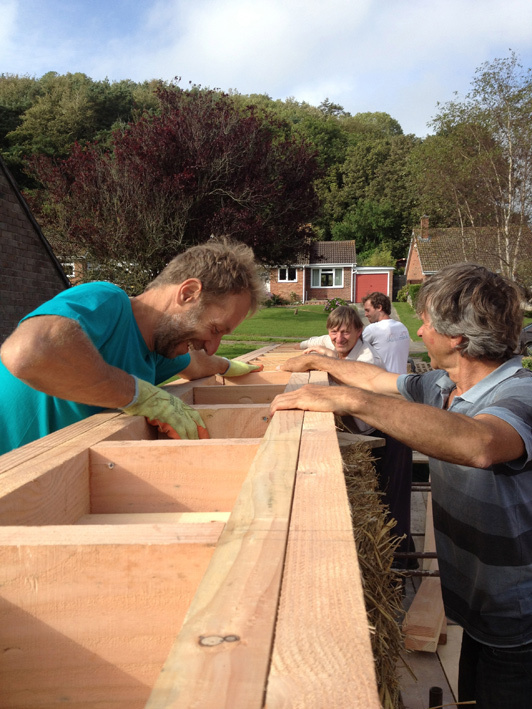 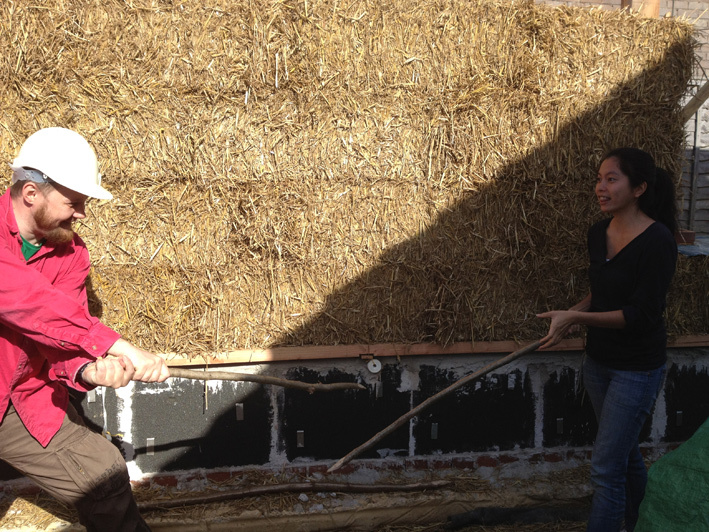 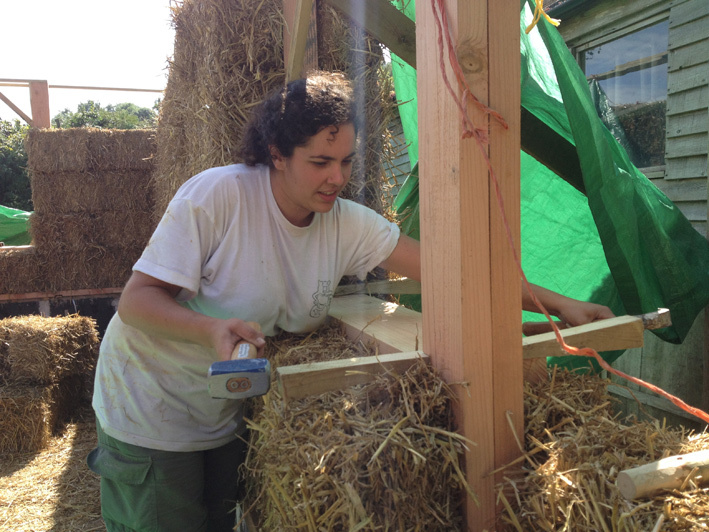 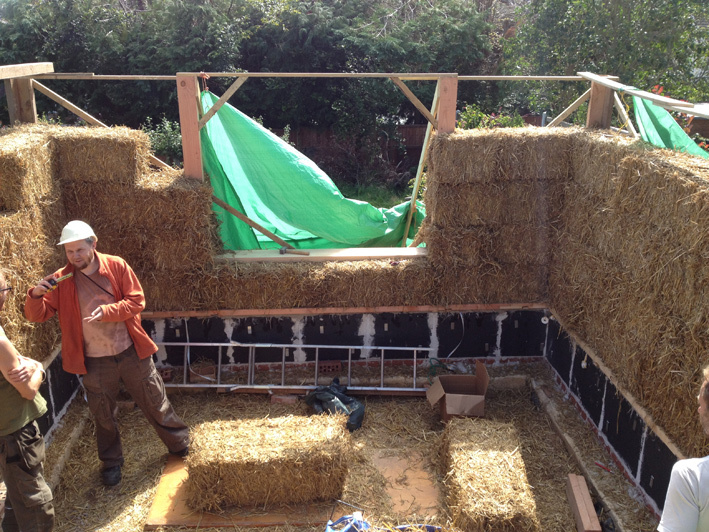 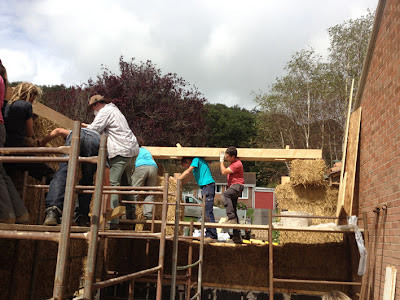 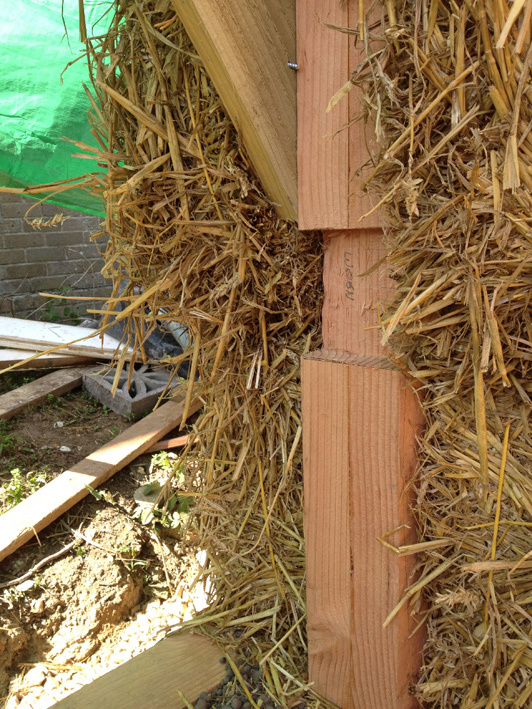 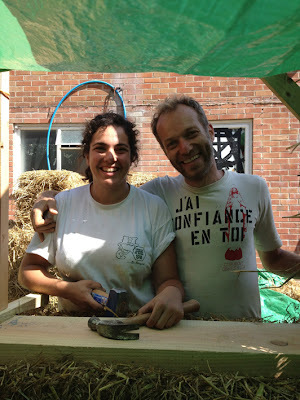 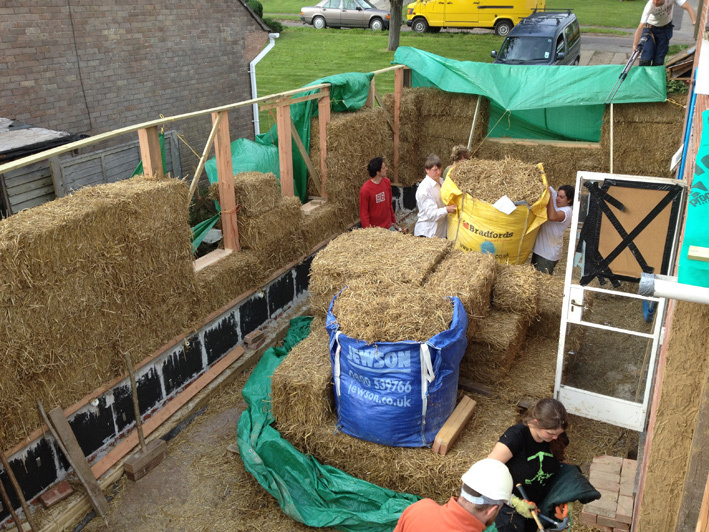 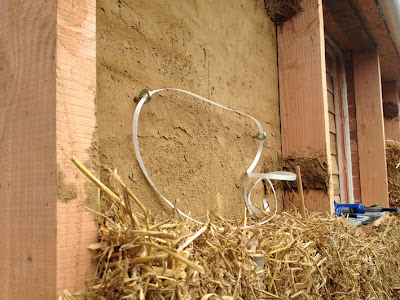 Coralie using the window sill (fitted into the notches) to compress the bale underneath by hammering in folding wedges. 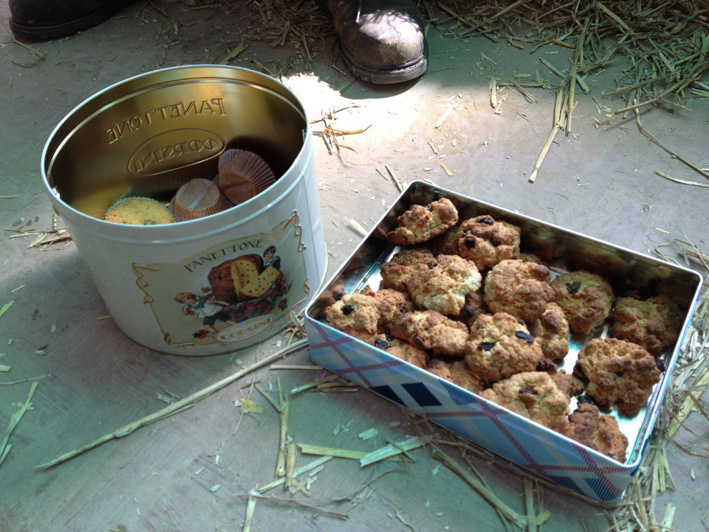 Fairy cakes by our friend Penny, rock cakes by my mum. All scrumptious. 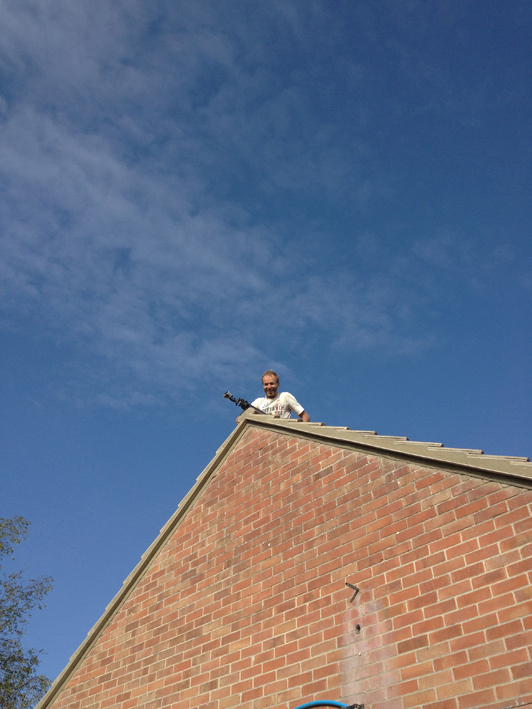 Kuba bashing a stake in. 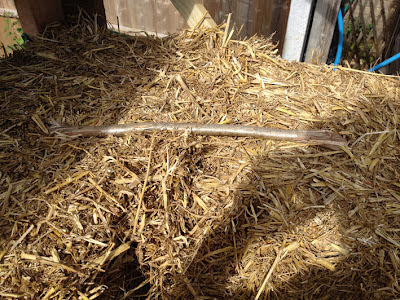 The fourth layer of bales is pinned to the rest with long hazel stakes. 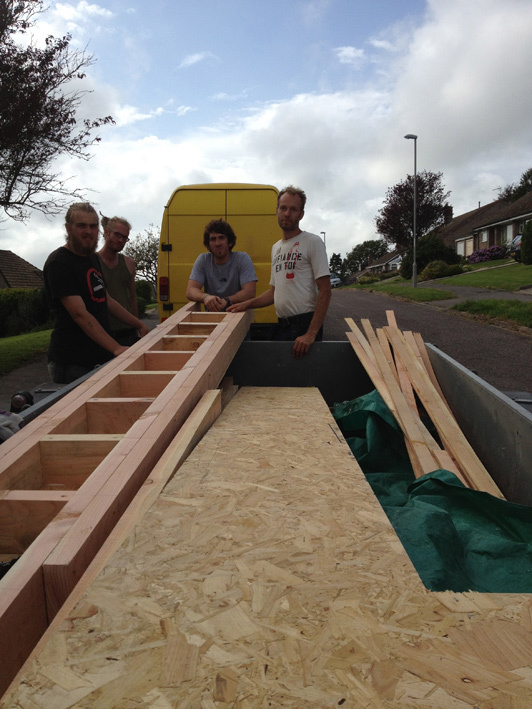 The first wall-plate sections arrive from Darren's workshop. 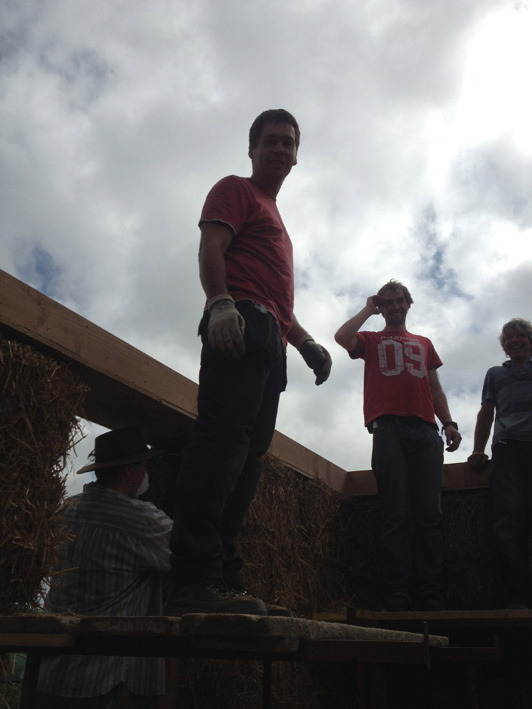 Aksel, Joe, Mark and Kuba (and me behind the camera) take in how big and heavy they are, and contemplate how to get them up on top of the walls. 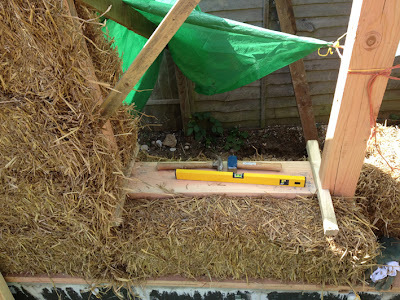 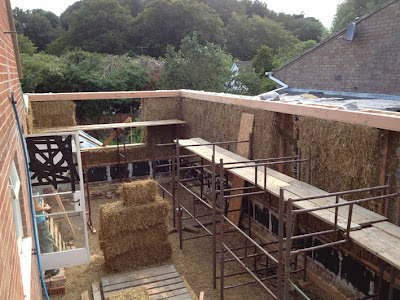 Cursing of structural engineer's over-engineering begins. The first week's team (a good number stayed for second week and were joined by more). 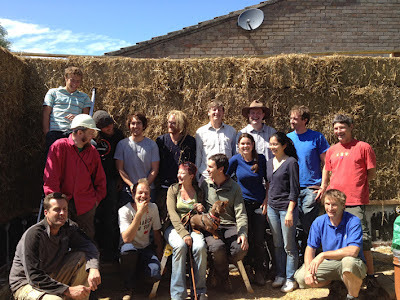 Front row: Darren, Kuba, Anna, me, Julia, Civita, Tim. Back row: Luke, Marcin, Aksel, Mark, Joe, Robert, Sam, Jonny, Mike. 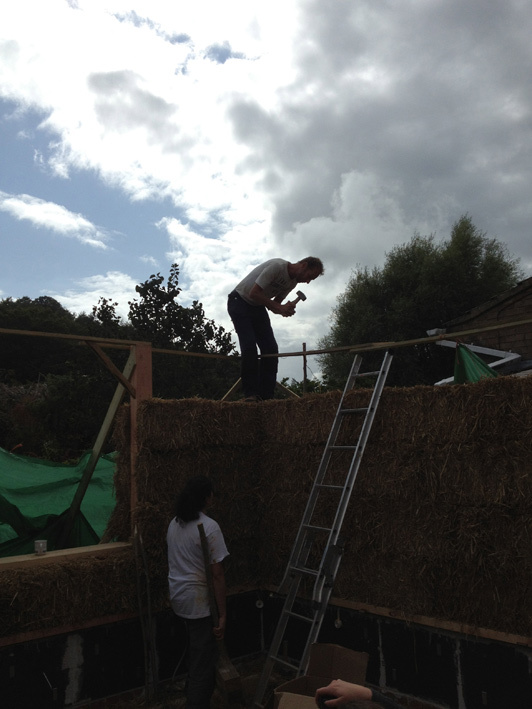 Kuba setting up his time lapse camera. 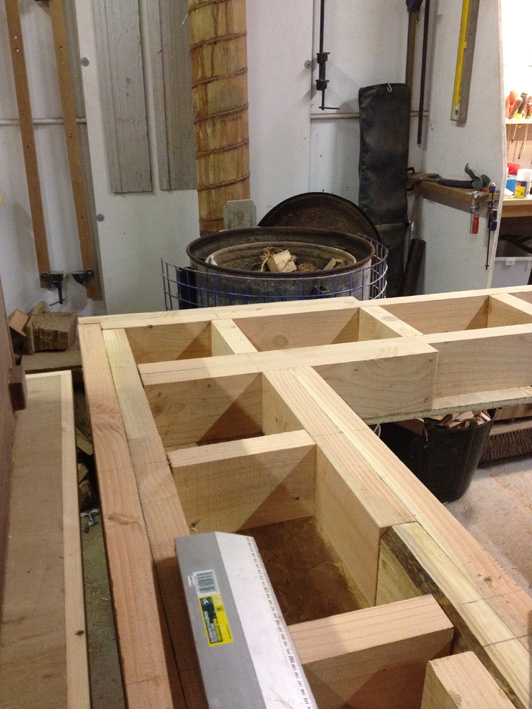 More wall plate, squeezed in to Darren's workshop. It's a big workshop but the wallplates only just fitted. He said moving them around was like playing Tetris. 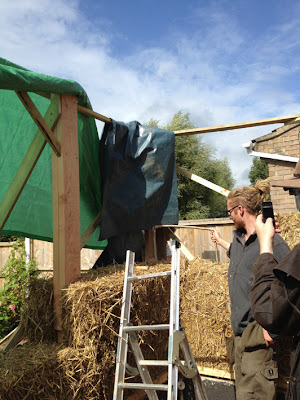 ...the strapping passes over two verticle hazel poles which are slotted into the ends of a horizontal timber, forming a big 'H' which is clamped back toward the wall using the ratchet tensioner on the strapping. 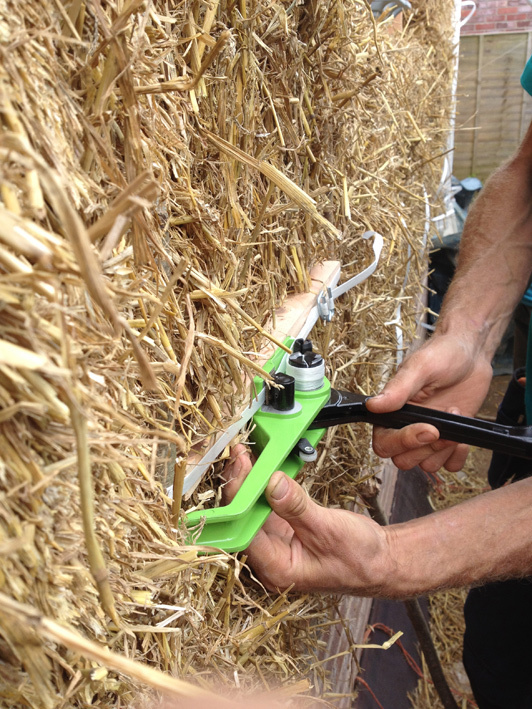 This secures the bales to the bungalow wall and helps compress them. 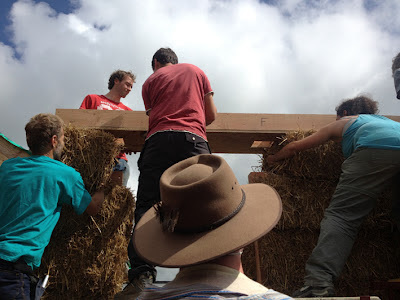 The baseplate is (intentionally) set up so the space above is slightly less than the number of bales we need to fit in. The penultimate row of bales is then compressed downwards using jar-jacks and a steel plate, the last bale is squashed in, resulting in a dense, strong, compressed bale wrap. 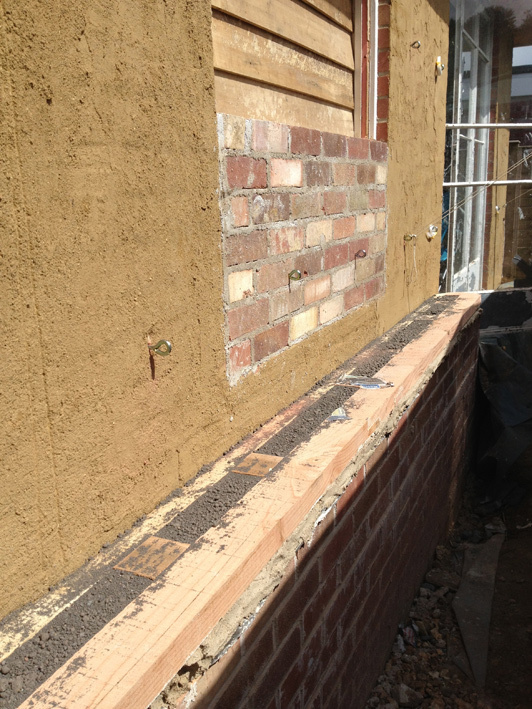 Joining the sections of insanely unwieldy wall-plate in situ. 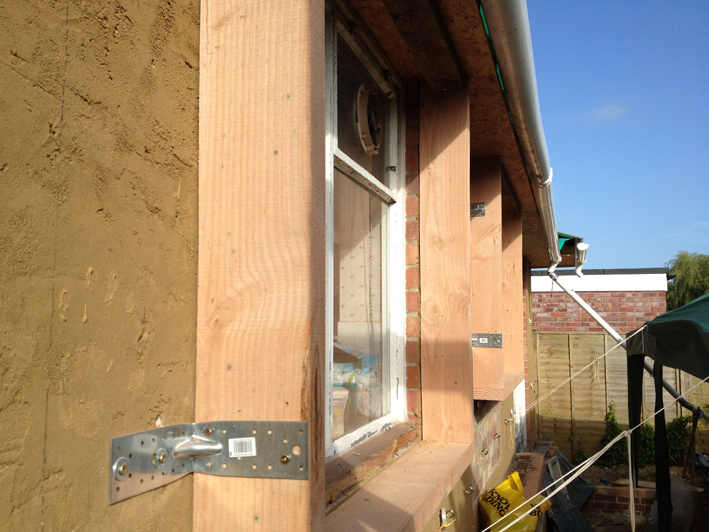 The last door post is slotted through, signifying complete walls for the extension. Everyone clapped and cheered, which surprised me, but was lovely. 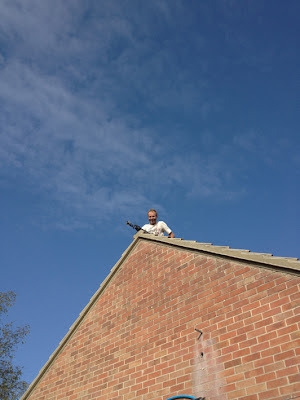 Mum said it was a proud moment, and Dad would have thought so too. 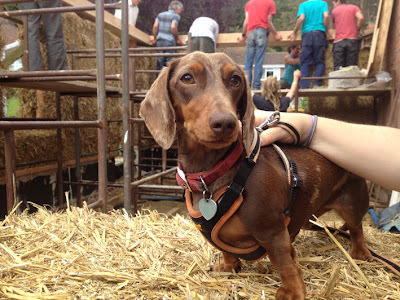 We both got a bit weepy for a brief moment then pulled it together.